We don’t normally pay attention to ‘national days/months’ but… next month is ‘National Bed Month’ and it’s one we quite like. The Go Modern team have various bits of folklore about what they do and don’t do to ensure a good nights sleep. “No coffee or tea after 4pm… always use ear plugs or a sleep mask. Black-out blinds at the windows, no electric light ANYWHERE in the room. Turn off all mobile devices. Read at least one page of your current book (maybe not a thriller!). Get a decent mattress/bed”. It’s beginning to sound like an obsession isn’t it? But, we don’t think we’re alone. All the research around sleeping tells us that we spend about a third of our lives in bed. So, it makes sense to get it right. A decent bed is a big investment. But if you’re having difficulty sleeping and you’ve paid attention to the smaller things (coffee here’s looking at YOU) one of the major things to think about is your bed. A well made, comfortable and supportive bed can make the difference between a great night’s sleep or a poor one. We all know that a night without much sleep means a tired and grumpy person the next day. And experts tell us that sleeping on an uncomfortable bed also robs you of up to an hour’s sleep a night! Along side this, a decent night’s sleep is good for the brain and the heart. It also helps us maintain a healthy weight and helps us learn. We remember more, problem solve and make better decisions. It also cuts down on stress, mood swings and depression. It’s a no brainer really isn’t it. At Go Modern, we take beds very seriously. 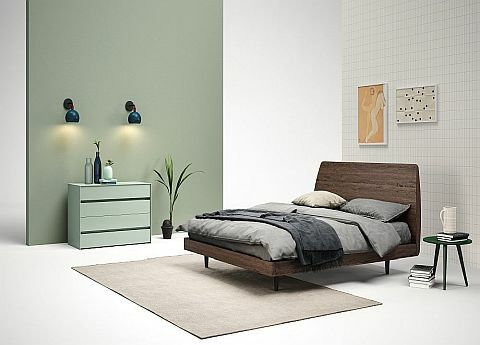 We have an extensive range of contemporary beds and bedroom furniture, much of it sourced in Italy. Our bed collections cover lacquered beds, wooden beds, upholstered beds and storage beds – often with crossovers between all of these styles. Whatever you’re looking for we’re confident we can supply it. And not just for adults. We also have a wide range of bedroom furniture for children and teenagers. Our Nidi collection of beds for children and teenagers is extensive, extremely well made and full of imagination – hopefully just like our children. Most designs are modular and so can be adapted to suit the child or children, the amount of space and important things such as storage (of which there is never enough in our experience). Three to 12 year olds are said to need between 10 to 12 hours a night sleep. Good luck with that one! But it definitely makes sense (and for the sanity of the entire family!) to start with their bedroom environment. 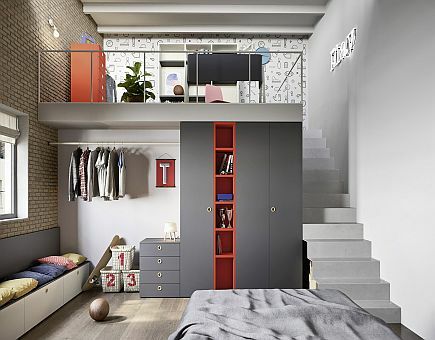 At Go Modern we have cleverly designed bunk beds that incorporate storage space, beds with children’s desks, trundle beds, and some which can even fold up into the wall when not being used. Plus, bookshelves, bedside cabinets, chests of drawers… all in a huge selection of colours and finishes. And if you’re looking for ideas on how to persuade your teenage offspring to a) get more sleep at the right time of the day b) stop using the floor as a ‘floordrobe’ we can help with that too. From comfy sleep inducing beds to stylish storage solutions in an array of trendy colours and hard-wearing finishes. There are lots of articles out there about ‘what type of mattress to choose’ but not so many on ‘what style of bed’ (although we also sell lots of very comfy, hand-made mattresses too). The style of the bed you choose is a very personal decision and basically down to what your own interior design style is like. 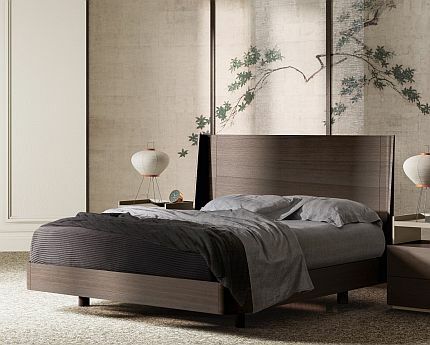 If you’re a minimalist, then a bed with a wooden or lacquered frame will probably be the kind of design you’re looking for. Both styles also come with a matching collection of bedroom furniture. A tidy, minimalist room makes for a tidy mind… and a restful night’s sleep! 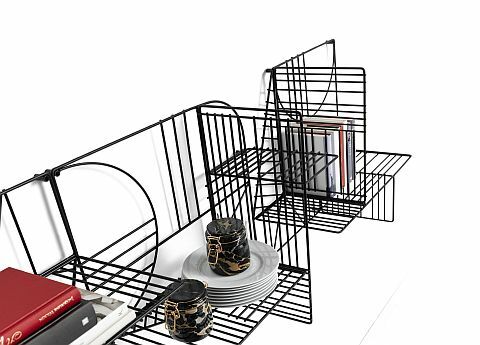 So, de-clutter and keep a space that’s neat and simple. Blitz your bedside table, keep everything calm and unfussy. The Bend contemporary bed (above) has a beautifully curved headboard (shown here in rovere gessato – a white lacquer which has the grain of the wood remaining visible). You can also choose from another 21 smooth matt lacquer finishes. Our Kings Road showroom is simply not big enough to have a sample of all the beds we sell but we always have sample books of finishes and colours. 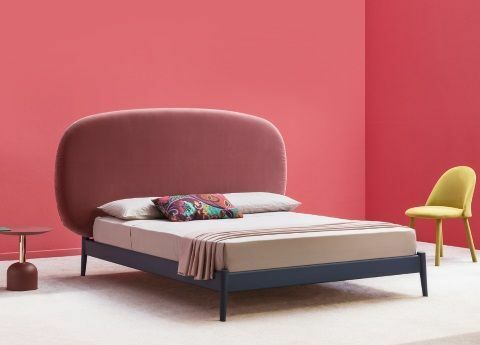 The Bend bed is also available as a storage bed, with a storage base and gas lift pistons under the mattress supports (slats), so that it’s easy to lift to store spare clothing, bedding etc inside the sealed base. 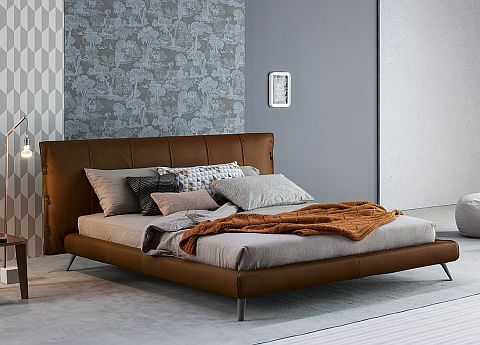 The elegant Charles bed, (above) from luxury brand Jesse, has a sophisticated curved headboard and base which can be chosen in thermal oak (as seen here), or matt lacquered in a range of colours. 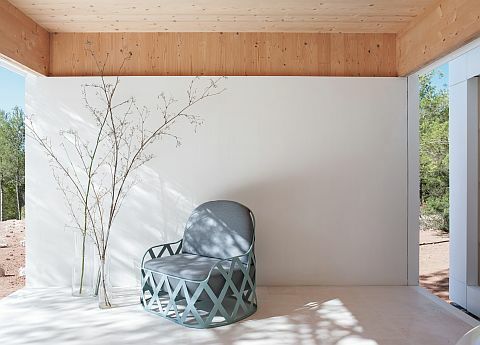 If this is a little too minimalist for you the designers, Alfredo Chiaramonte and Marco Marin, have cleverly created an upholstered back panel. This can be draped neatly over the headboard and comes in a huge choice of materials from lush velvets to soft leathers. Definitely the best of both worlds available here. We have a wide selection of upholstered beds that includes everything from fabric to leather beds. Upholstered beds also offer lots of flexibility as there’s a wide choice of materials to choose from. And many of the fabric beds have removable covers, which is not only great for cleaning, it also means you can change the style of your bed relatively easily. If you’re sensitive to noise it makes sense to chose furnishings that will absorb any ambient sound. So, think lined curtains, thick carpets and upholstered bed frames – all worth throwing into the mix of ideas. 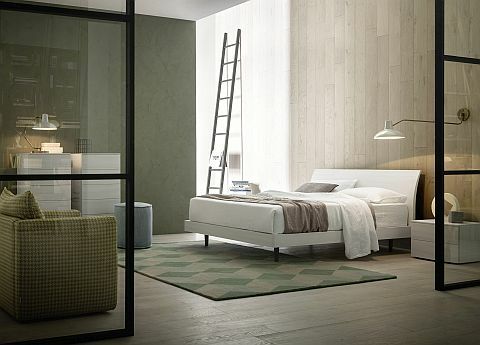 The upholstered Cuff bed (above) was designed by Mauro Lipparini for Bonaldo. It has some beautiful tailored details – from the frog fastenings that adorn the ‘cuffs’ to the pleating which makes up the vertical pattern on the headboard. It also has visible leather inserts on both the headboard and bed frame. It’s shown here in leather but the Cuff bed can also be upholstered in both fabric and leather. So, good luck with National Bed Month. There are lots of fabulous ideas and sensible words of advise for those looking to improve their sleep from The Sleep Council. To see Go Modern’s full range of beds and bedroom furniture hop over to the bedroom section of our website. Sweet dreams! 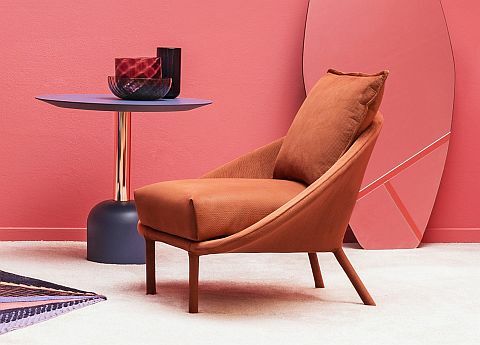 We rather like ‘Living Coral’, Pantone’s 2019 colour of the year. It may be diving in at the deep end for some, but we love all the associated shades of cinnamon, terracotta, orange, pink and amber that this warm colour embraces. And our brands seem to like them too. So jump on in and take a look at some of our latest pieces in all the exciting variations of this on trend hue. Quirky Italian brand Miniform’s loves playing with colour and shape. Their latest design is Lem, a beautifully soft and sinuous collection designed by Francesco Beghetto. The Lem design has a tubular structure and is fully covered in fabric. Their are four pieces in the range: a two or three seater sofa, an armchair (above) and a footstool. Lem has 37 different fabrics to choose from, including lots of coral shades such as the wonderfully sounding ‘regal orange’, ‘abstract yellow’ and ‘tram orange’. And it’s not just fabrics that have gone 50 shades of coral. Novamobili’s new contemporary storage range, Cube, is offered in 25 different matt lacquer finishes. Lots of beautifully warm shades… think ochre, tangerine, garnet and salmon. 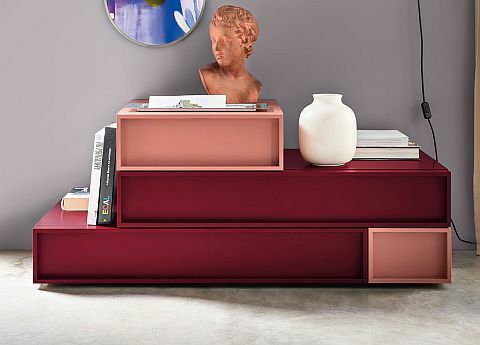 Additionally, you can mix-and-match any of these colours, as in the styled image above, where Novamobili has used a combination of salmon pink and garnet red on the different drawer sections. We absolutely love this combination and the flexibility of the design. 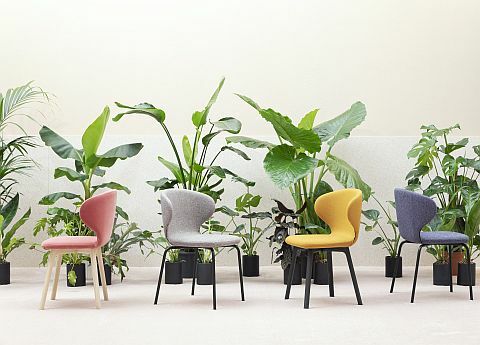 Mogg is a relatively new furniture company that first exhibited in Milan in 2012. We fell in love with them on the spot! In short, they cleverly cross the border between art and design in a world where mass production has sometimes left this far behind. 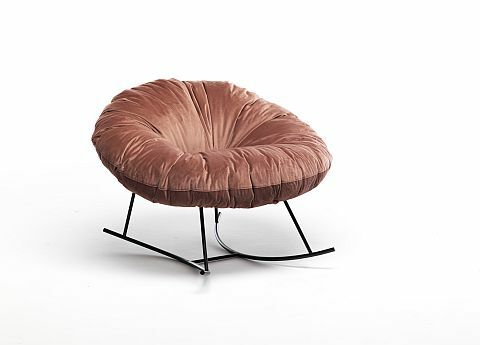 The Closer rocking-armchair was designed by Marzia and Leo Dainelli for Mogg and it’s a seriously sleep-inducing (in a good way!) piece of work. The deep upholstery envelops you in its dreamy softness, like a duvet locking out the coldest of winter chills. The filling is reinforced with feathers and the removable cover comes in velvet, finest wool or leather. Plus, the slim, black metal structure creates a rhythmic, gentle rocking motion. It’s perfect for a living room or nursery… or anywhere you want to feel hugged and cosy. We’ve seen shades of coral used across lots fabrics and lacquer finishes but the clever design team at Tonelli have also used it in some of their latest glass creations. Each table in their new range, ‘Country of Wonders’, has been made using a unique technique where glass fragments are hand poured into cone and sphere shaped moulds. And this striking coffee/side table is one of the amazing results. We love that the translucency of the glass also adds extra warmth to the design. We reckon Coral has ‘shades of’ that will work for any room in the house. And depending on your taste there are variations that would fit with almost any style of interior. 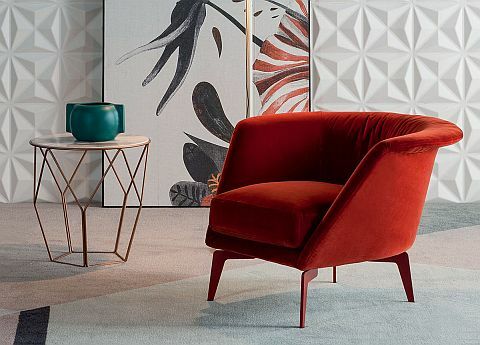 The deep, vibrant red of the plush velvet covers on Bonaldo’s new Lovy armchair (below) look stunning against the white walls. The stylist has also used a piece of modern art featuring large, over-blown flowers with shades of coral stripes on the petals that beautifully reflect the colours in the chair. The paler pastels of the carpet also allows the Lovy to confidently take centre stage. The Lovy was designed by Sergio Bicego for Bonaldo. 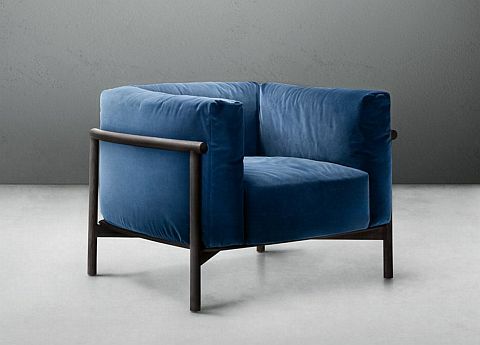 In our book this would be a perfect armchair for a living room, bedroom or large bathroom. It has an enveloping, oval shape and generous width. But if the dramatic colour used here is a shade too bold for you, there’s a huge choice of fabrics and other colours to choose from. The feet can also be finished in a wide range of lacquer colours, including stylish metallics. 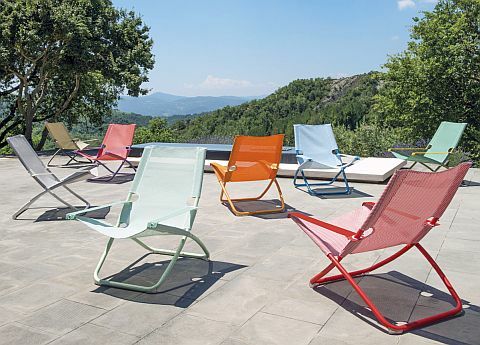 Also brand new from Bonaldo is the Panorama collection. In addition to the terracotta fabric used in the image below, there are up to 30 other fabrics and different colours to choose from, including supplying your own choice of fabric, and a great range of leathers. Designed by Fabrice Berrux, the Bonaldo Panorama sofa is beautifully made and luxuriously comfortable with modular options to create a much larger sofa. The upholstery features a criss-cross design on the seats and the sofa comes in three widths of 200cm, 230cm and 260cm. So what’s the story behind Living Coral? According to Pantone’s website,’ ‘Living Coral’ embraces us with warmth and nourishment to provide comfort and buoyancy in our continually shifting environment.’ Similarly, they tell us, it is a ‘reaction to the onslaught of digital technology and social media increasingly embedding into daily life….’. Well three cheers to that! We think that is a wonderful reason for choosing this feel good colour. Anything that helps us switch off from the digital onslaught (although do finish reading this first!) gets our vote. In short it’s a wonderfully warm, optimistic shade – and we could all do with some of that at the moment. Are you ready to dive in yet and take a chance with any of the wonderful shades of coral around? If you are, now’s a good time to take the plunge as our January sale is still on for a few more days. With 15% off any order over £1,000, it’s an offer that should definitely leave you feeling in the pink. Happy New Year! We hope you had a good break and that the house is now back in order with a sense of calm. Good luck with that one! If it’s minimalism you are trying to achieve one of this year’s furniture trends might just appeal. The big one that struck a chord with us is the use of simple, graphic lines. Look out for a fabulous fusion of minimalist design and illustrative style. Strong graphic silhouettes, sharp lines and plenty of drama. 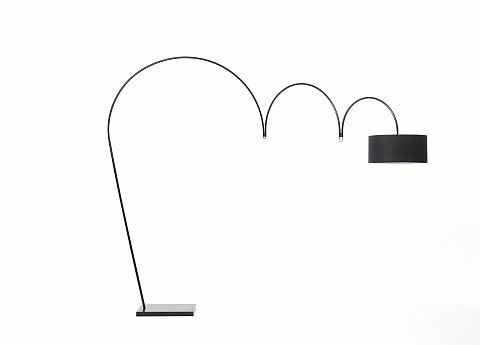 Mogg’s Bla Bla lights by Emanuele Magini provide great ambient light… and a great talking piece! We absolutely love them. 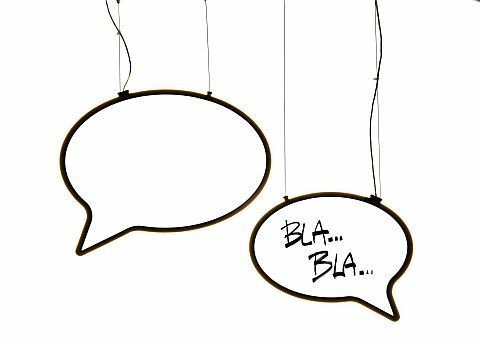 Drawn as large speech bubbles you can have them made with or without the words. Graphic lines or patterns are also turning up as popular decorative finishes. 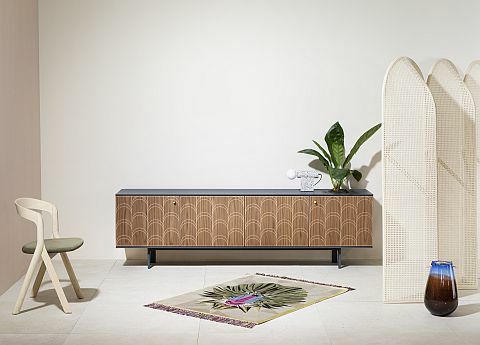 A number of sideboards this year feature some striking repeat graphics. We have all fallen for Miniform’s new Celia sideboard. The style takes its inspiration from the Art Deco movement of the 1920s. Its beautiful lacquered wood frame has been finished with a silk-screen graphic pattern. A repeat crescent moon features across the doors which open like a book. For a touch of decadence choose handles in copper or lacquered metal. The sideboard above is in anthracite ash but you can choose from nine other colours including Apricot, Veronese Green, Intense Blue, or Masala Red. At Go Modern we choose pieces where there is often a fine line between art and furniture. Although every design always has to be highly practical. Our customers are also often on the hunt for arty, stylish storage ideas and the Musa from Mogg fits the bill perfectly. With its highly defined lines the Musa shelf, by Alessandro D’Angeli for Mogg, is part graphic wall art and part practical shelving. It’s a modular design which means that you can group each section together however you want to. To make a real statement there is a version of the Musa with a gold lacquer finish or choose the matt black shown here for added drama. Each module measures 60.5cm wide x 26cm deep x 60.5cm high. If you want to introduce some graphic style to your flooring we have the ideal suggestion. 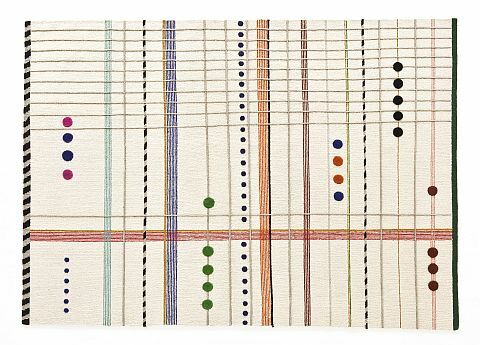 Rug maker Nani Marquina started making rugs back in 1987. She creates the most wonderful and extremely high quality designs. Each rug is made by hand in India by master crafts people using the finest New Zealand wool. Nani’s rugs are not only beautiful but are also investment pieces which will last for generations. Amongst some of her latest collections is a range called Rabari. 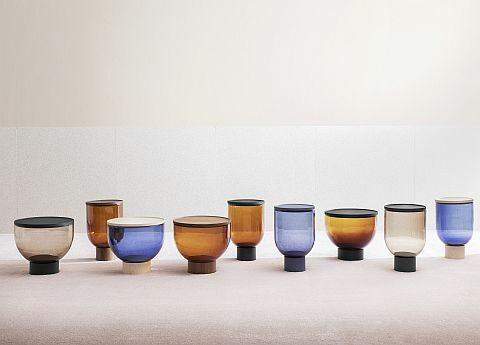 The Rabari collection was designed by Nipa Doshi and Jonathan Levien for the Nani Marquina company. The designers’ intention was to create a series of rugs that evoke the ‘sensual and shiny world’ of Indian tribal folk embroidery. Each of the three designs in the Rabari collection are different but each rug shares a strong graphic style. The hand-knotted and hand-woven designs uses the traditional Sumak tecnique. Each rug has a density of 124,000 knots per meter squared with a total pile height of 13mm. The very nature of table design means that incorporating a graphic look is pretty much a given. 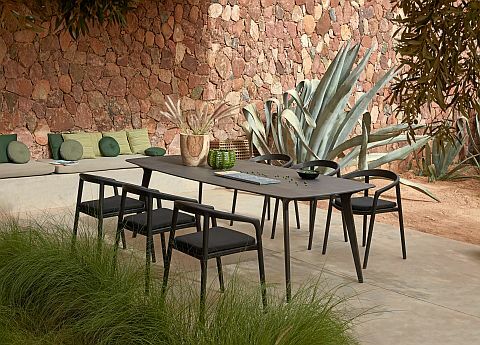 But high-end Italian manufacturer Lema has taken this to another level with one of its latest tables. The Alamo dining table, designed by David Lopez Quincoces, has a very strong minimalist style with an overall theme of lightness. The essential, graphic outline create a timeless look which is added to by the use of combining different materials. 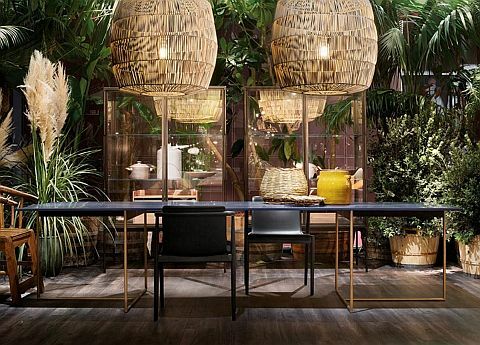 The table structure is in bronze coated painted metal, while the top is in a reconstructed marble material in three colours inspired by natural stone: Blue Lapislazzuli, green Malachite, Belgian blue/black, along with heat treated oak. And there are four different sizes to choose from. It’s not all about the indoors when it comes to graphic design. 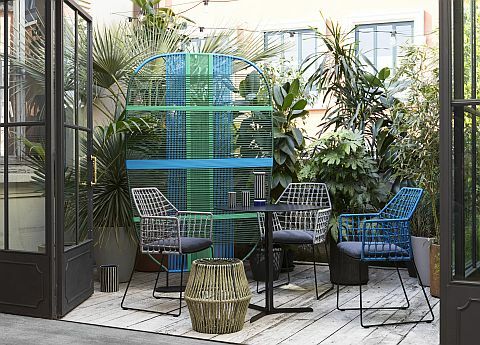 Add some beautiful and striking structural elements to your garden or patio area with Saba Italia’s highly innovative Shades of Venice space dividers/screens. The new design features bright horizontal and vertical graphic lines to create a peek-a-boo effect, which subtly reveals or hides the space beyond. 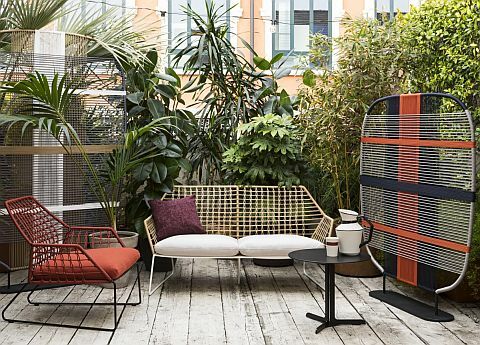 The flexible Shades of Venice also provide infinite styling possibilities and as well as well as being a great idea for the garden they can be used indoors too. Plus there’s a lovely story attached to the colours/shades (the clue’s in the title!). Designer Marco Zito has used colours associated with different Venetian islands for his inspiration. Murano reflects the blue and green of the world famous Murano glass it produces. Burano is known for the colourful oranges and blues as used on the island’s houses. Giudecca is an island with many white stone buildings. While Sant’Erasmo grows an abundance of vegetables, such as artichokes, with their beautiful dusty greens, purples and browns. So there’s a bit of detail to share on a sunny afternoon on the patio. You can find all of these products on the Go modern site. And if what you’ve seen hasn’t tempted you enough, we now have our January sale up and running. Use coupon code JANUARY when you check out (or speak to one of the showroom team) and receive a wonderful 15% off all orders where you spend over £1,000. If that doesn’t help to make a happy new year we’re not sure what will. The hugely influential Bauhaus movement celebrates its 100th anniversary in 2019. It’s a style that has shaped everything that we now recognise as ‘modern design’. The Bauhaus influence is also what we think of as ‘good design’, although it’s sometimes hard to understand what all the fuss was about as the Bauhaus look is so popular and universal. Contemporary design is at the heart of everything Go Modern represents. For us it’s the vital fusion of art and craft, plus practical design and strong functionality. It’s a rejection of the overly ostentatious in favour of clean lines and simple style. Without the Bauhaus influence there would be no Go Modern. What was the Bauhaus Movement? The Bauhaus was a fine arts and crafts institution founded in 1919 in Wiemar, Germany. It kick-started an exciting new way of thinking that has gone on to influence the look of many things produced today. It also created a new type of artist. They were to be arts and crafts people, taught in workshops rather than classrooms, learning to turn their hands to anything. The teaching philosophy broke down the barrier between fine art and applied arts. The movement strongly favoured a return to individual craftsmanship. It also rejected anything overly fancy, which was a style that had dominated earlier nineteenth and twentieth century design. The style began to emerge across buildings, furniture and home accessories, and was recognised as something simple, rational, and functional. The other signature look of The Bauhaus was circular shapes, angular frames and abstract blocks of primary colours. In tribute to the special Bauhaus 100th anniversary we’ve selected some of Go Modern’s latest launches, many of which represent the very best of this iconic style. We love the beautiful Mula dining chairs, designed by E-ggs for quirky Italian brand Miniforms. The curved shape echoes the ground-breaking Series 7 and Swan chairs by the great Danish designer Arne Jacobson. Born in Copenhagen, Arne Jacobsen trained as a mason before studying architecture. He worked independently as an architect, interior designer, furniture, fabric and ceramics designer. We think Jacobsen would have liked the Mula chairs – high on design and equally high on comfort. The chairs can be upholstered in a variety of fabrics, including eco-leather, a superior faux material that looks and feels like the real thing. The legs are in lacquered metal. And staying with Miniforms, here’s the new Illo dining table which was designed by their in-house team. For us, it’s the perfect fusion of art and craft. 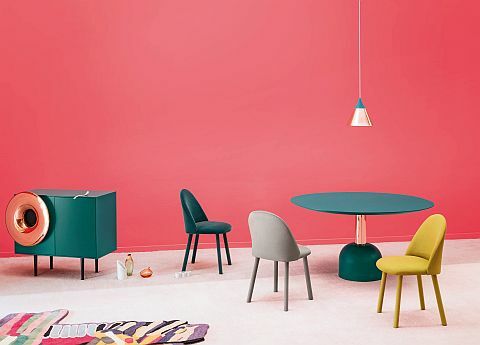 The Illo’s smooth, round table top can be lacquered in seven bold, bright colours including white, dusty grey, silk grey, black, intense blue, Veronese green or Marsala red. The central column can also be lacquered in any of the same colours or, for a touch of un-Bauhaus ostentation, choose a striking, shiny copper finish. There’s also an lllo coffee and side table to complete the look. Well, we all fell in love with these Mastea tables when we saw them last month. 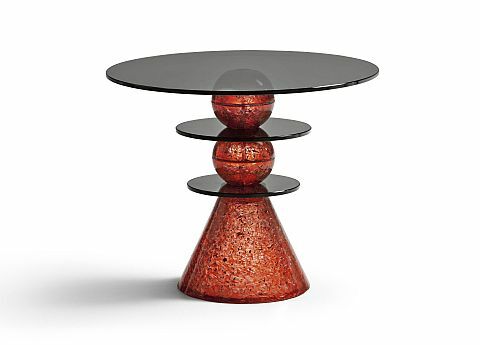 The simple curved bases are made from beautiful blown Murano glass, which we think is truly inspired. As you can see from the image, there are a number of different colours to choose from – amber, blue-grey or smoked grey. The design has been topped and bottomed with Canaletto walnut or ash. Please form an orderly queue! A brand we work a lot with is Lema; striking designs of the highest quality. New from them is the Taiki armchair, a reinterpretation of the classic 1928 modernist Le Corbusier design, with simple clear lines and beautiful, equal proportions. 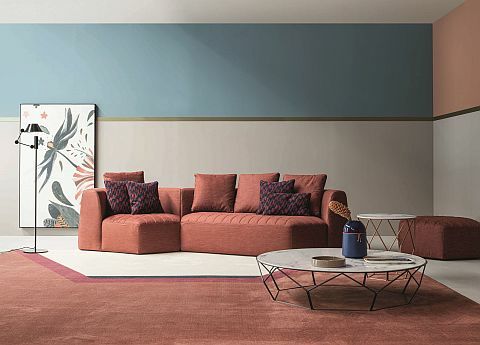 The Taiki was designed by Chiara Andreatti and is part of Lema’s 2018 ‘modern living room’ collection. The visible frame and legs are in heat-treated, oak tinted ash, and the deeply padded upholstery is carefully finished with hand-stitching. We thought it was time to feature something from our new bedroom collection. So, taking things back to basics is Novamobii’s new Dedalo bed. It’s simply a stylish ‘no frills’ but hugely comfortable bed with an understated contemporary elegance. The design has a clean lines, a tapered headboard and a frame in eco-wood, which is a stylish but practical, hard wearing matt laminate. The design is also available as a storage bed which lots of our customers love – storage space is something that’s always at a premium for everyone. The storage version has an easy-to-use gas-lift mechanism (which we’re reliably informed allows you to lift the bed while keeping all the bedclothes in place…. a very pleasing attribute!). 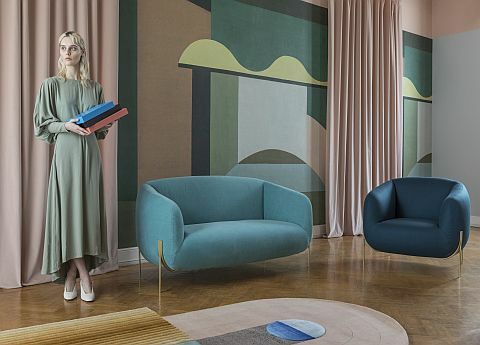 Back to the living room, the new Geo collection from the wonderful design team at Saba Italia feels like a perfect piece of Bauhaus influence. Designed by Paolo Grasselli, the Geo range comprises a sofa, armchair and pouf. Each piece has very deep proportions and Grasselli’s intention was for the shape to ‘hug’ the body. We can confirm that it does this so well that we developed a reluctance to move on to other exhibitor’s stands when we first tried it out in Milan! The slim line metal structure and legs also subvert the design norm by being placed visibly outside of the frame. 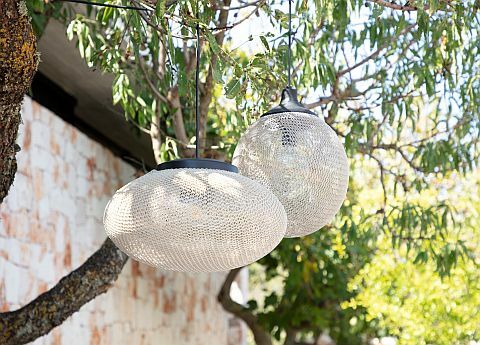 This idea gives the appearance of everything floating above the ground – and not a glass of Prosecco in sight! And talking of Prosecco… Celebrate this great design phenomenon next year. There are lots of events taking place around the world and here in the UK too. Look out for them and enjoy finding out more – we’ll see you there! Our Kings Road showroom has a regularly changing display of furniture, including white furniture, plus modern art. The art is beautifully curated by our friends at Tag Fine Arts and one current piece sums up winter. It’s called ‘Balloon’ by Dede Johnston and is over a meter wide, one of five signed editions. 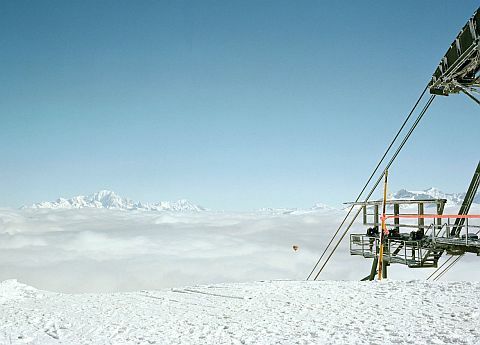 The image is from a series entitled ‘The New Wilderness’, a C-type print of a scene from Courcheval, France. It captures the perfect stillness of snow and is wonderfully ethereal. Look carefully. A tiny hot air balloon floats above the clouds, highlighting the scale and beauty of our natural world. Sometimes it’s difficult to get a handle on emerging trends…are metallics STILL with us, will taupe ever go away? But this season we’ve had no problems spotting what’s going to be BIG in the world of interiors next year. Think COLOUR. 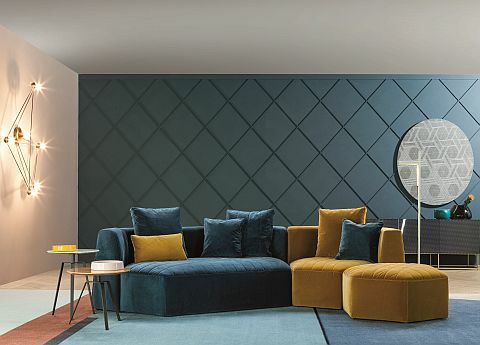 Beautiful jewel tones: sapphire blues and yellows, garnet reds, emerald greens, aqua marine… wonderfully rich colours that will breathe life into a room, complement existing schemes or add a striking pop of colour to a room (for those of us still in love with our Down Pipe Grey walls – you know who you are). So, the end of another fabulous and very busy London Design Festival. Whichever venue we visited the buzz and creativity just blew us away! Our own little creative spot was down on the South Bank behind the OXO Tower, where Design Junction had taken over some space. Doing their utmost to green up our urban jungle was the amazing Urban Roof Gardens, a dynamic London company that aims to blur the boundaries between people and plants and create a little bit of roof art along the way. 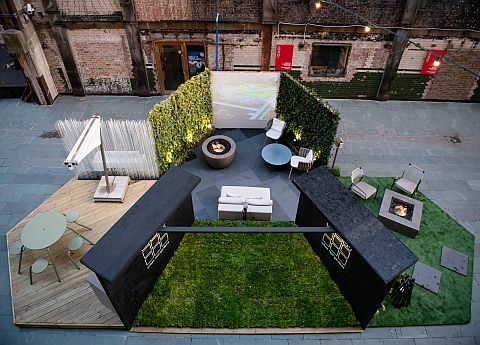 Urban Roof Gardens borrowed some of our outdoor furniture to complete their installation and we were pleased as punch to be involved in our own small way.